Please have your Docks & Boats decorated from 9:30 AM until 1 PM with phone number displayed prominently for the judges. Flotilla participants gather by 9:50 AM at Wooters Point on the East Side of the lake. At 10 AM the Flotilla departs in 2 groups from Wooters Point and then returns on the West side of the lake across from Wooters Point where boats will disperse. The North group leader/dock judge will lead the boats to the north end of the lake where judging will take place. The South group leader/dock judge will lead the boats toward the south end of the lake, crossing over to the west side prior to the stumps for judging. Display your phone number in large, BOLD print for the judges. If there is inclement weather (high winds, rain, thunderstorms) at 9 AM, Monday, July 4th, the Flotilla & Dock Decorating Festivities will be cancelled. If you have any questions about the festivities, where Wooters Point is on the lake or how to help with Flotilla judging for the north & south Flotilla routes, please contact Sharon Natzel at 763-355-7908. You can review the information in the Spring Newsletter online under Board Communications. Keep an eye open for Pirates! Several years ago, Lou Schultz, former Long Lake Area Association Board member, developed a plan for lake residents to obtain signage for their docks which would show their Emergency-911 number on the lake. If you have ever tried to locate an address from the lake, you know how difficult that can be. LLAA sponsors the dock sign program because it is a safety issue for boaters and residents on the lake, but the association does not profit from it. 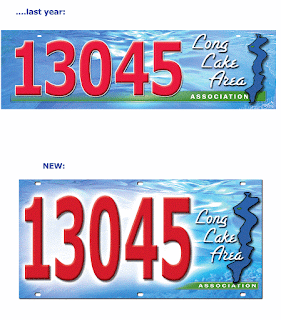 Dock signs help people, especially emergency responders, find addresses on the lake. There was an incident of someone needing help and the sheriff's boat was on the lake but couldn't identify where to go. If someone calls for help, the water patrol has no way (without dock signs) to identify which area is needing help. 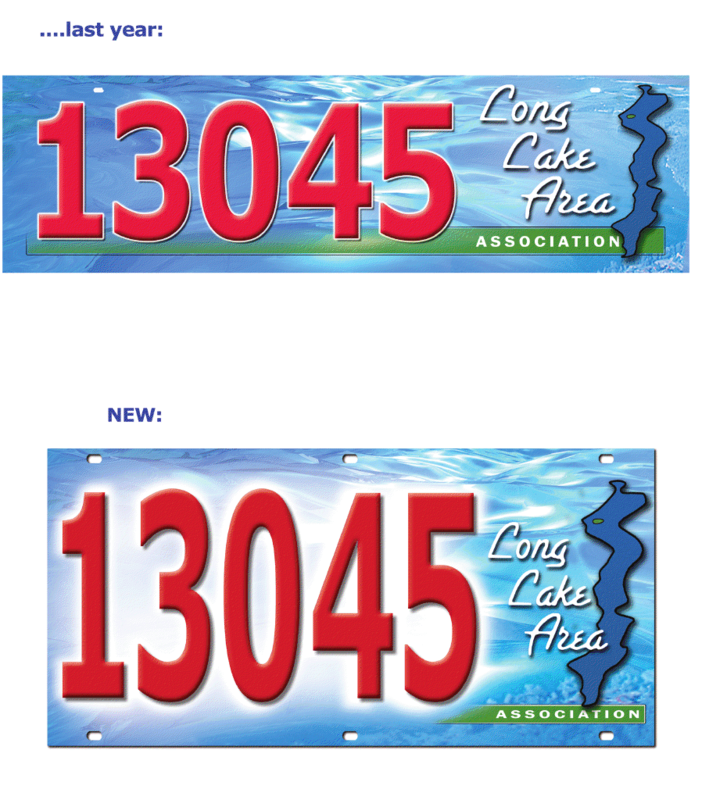 "Next Innovations" in Walker, MN made our original signs and the Lake Association placed bulk orders when there were sufficient numbers to reach the minimum required order. A suggestion was made that it would be helpful if the signs were slightly larger and the color more reflective. As a result, we now have a design which measures 5.75” X 11.75” The color scheme has remained the same, but is enhanced to make the numbers more visible. The powder coated enamel is on heavy gauge metal, slotted for screws. Below is a sample of the new sign along with the previous design. The new signs are available for $20.00 each. Again, we must meet a minimum order number. Please send your check to: Long Lake Area Association, P.O. Box 808, Park Rapids, MN 56470. Be sure to write “dock sign” on your check and specify the E-911 number you want on your sign and the number of signs ordering. These signs are also good for placement on your house or other outbuildings. If you have any questions about the signs, please call Larry Roberts at: 218-732-0118 or email:lrobertsmn@gmail.com. This is 39 pages long so it may take a while to load. The Annual Meeting was held today. We had a good turn out and the reports were well planned and well presented so the business meeting was completed on time as promised. Keep watching here on Long Lake Living.org for links to the power points and other notes; they are being double checked before we post them. Also, we will revise the Board Members page as soon as we get biographical information from the new board members. A big thank you to all this years board members for all their hard work and dedication. The Long Lake Area Association's 2011 Annual meeting is tomorrow, Saturday, June 25th. Meet your Long Lake neighbor's and enjoy refreshments, door prizes & fellowship combined with the business of taking care of our lake. This is the one time each year when we all get together, so come join in. The best way to get to Dorset and Nevis from the west side of Long Lake is to take County 4 to County 18 and across. The county asks that we avoid County 81 as it is a dirt road and cannot withstand the traffic. Actually it's free Admission to all Minnesota State Parks on Saturday, June 11, 2011 in conjunction with National Get Outdoors Day. The latest Long Lake water quality/clarity report has been posted from samples taken in May of this year. The link to the document can be found on the "Protect our Lake" page. It is a summary of how the new 2011 laws related to prevention of aquatic invasive species (AIS) now apply to boaters, property owners, service providers, bait dealers and others involved with the transportation of water-related equipment. The Minnesota DNR has posted a YouTube video on how to properly inspect your boat when moving it from one lake to another. It explains the new law regarding bait containers and bait water, drain plug rules and decontamination procedures to kill zebra mussels and other AIS. The two loon eggs from the nest being observed by Minnesota Bound's Loon Cam have hatched. Be patient (and persistent) in trying to access their webcam because they are having some problems with it due to large viewership over the past 24 hours.